Is the Poodle for You? – The Enchanted Poodle Club, Inc. The Enchanted Poodle Club, Inc. > Is the Poodle for You? Of course, we wholeheartedly believe that Poodles are wonderful dogs! They’re bright, personable, and loving. With their athletic build they are able to compete beautifully in almost any dog sport. Being the original circus trick dog, they are clowns with a great sense of humor. They love being with their people, and usually live long lives. However, they are not for everybody. 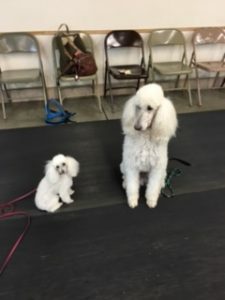 We address some common questions on this page, but we would love to have you visit the Poodle Club so that we can talk to you about your specific concerns. 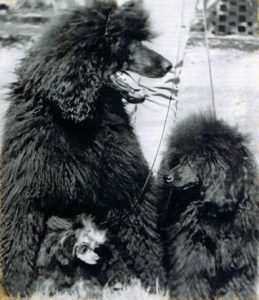 The Standard Poodle is largest. In America, it is defined as any poodle over 15 inches at the shoulders, although they are normally between 22 inches to 28 inches. The Miniature Poodle is the middle-sized poodle, and is between 10 inches and 15 inches tall at the shoulders. Most Miniature Poodles are between 13 inches and 15 inches. The Toy Poodle is the smallest Poodle, and is under 10 inches at the shoulders. There is not a “tea cup” Poodle, although the Toy Poodle can sometimes be very small. The terms Royal Standard Poodle and Tea Cup Toy Poodle are marketing terms but are not types of Poodles. Which size is the best? This depends on you. The first question to ask yourself is how much space do you have for your Poodle and how much exercise are you prepared to give your dog? You can keep a large Poodle in a small space provided you have time to exercise it at least twice a day. All Poodles are active, energetic dogs, but a small Poodle can exercise in a small space, running and playing in the house or going for short walks. Larger Poodles either need more space or longer walks. The second is what do you plan to do with your dog? If you want a couch cuddler, then the Toy Poodle or Miniature Poodle may be for you. The Standard Poodle and Miniature Poodle are suited for hunting, herding, hiking and jogging. All three varieties are suited for obedience, agility or therapy work. They are all good watch dogs and will alert you to anything unusual happening. The third, and most important, is do you have children? dog has its breaking point so that children MUST be taught the proper way to play with the dog. Puppies must be taught how to play with their people—no nipping at hands, for example, which can lead to biting. Puppies naturally play this way with their litter mates, but it doesn’t work well with people. If you’re thinking about getting a Poodle you may be one of the people who’ve discovered that they are allergic to dogs and have heard that Poodles are non-allergenic. Poodles are very low allergenic dogs, but there are no non-allergenic dogs. One of our members got her Poodle specifically because of dog allergies and it has worked out beautifully for her family. She thinks that what was originally a problem turned out to be a stroke of luck since she’s fallen in love with the Poodle way of approaching life, and their intellegence. However, another family we know has a child who is so allergic to dogs that he even reacts to Poodles, so they decided that they could not have a dog at this time. It’s important to test this out before getting any type of low-allergenic dog. There is no way around it; the Poodle’s coat is high-maintenance. Their coat does not stop growing and shed out–it continues to grow and has to be brushed almost daily and clipped every four to six weeks. There is a small amount of shed but it tends to stay in the coat and create mats. If you don’t want to learn to clip your Poodle yourself then you must use a professional groomer. A responsible breeder will tell you up front that Poodle grooming is expensive unless you do it yourself. The knowledgeable breeder can teach you to do this and mentor you in the care of your Poodle. There are simpler clips than the Continental Clip that everyone associates with poodles. While this trim has an historical basis, it’s not necessary unless you intend to show your poodle in conformation. There are several excellent books on Poodle grooming such as Poodle Clipping & Grooming: The International Reference by Shirlee Kalstone. And, of course, there are any number of videos that will give you a better idea of how to groom your Poodle, or, at the very least, what goes into grooming. If you get a Poodle you will have a dog with a sense of humor that will learn to read your moods. Your Poodle will do anything to get its way. You will have a fun loving, high energy dog that can entertain itself in constructive ways and destructive ways. You might say it is hard headed. It will remind you of living with a three-year-old child. The Poodle learns very quickly, and it is easy to teach the Poodle bad habits, which make it less fun to live with. This is why training is necessary. We want you to enjoy your new family member, and no one likes to live with a spoiled, destructive brat. If you prefer learning from books and videos there are a lot to choose from and more being published each year. It’s always a good idea to take at least on class, though. Visit dog training classes in your area and sign up with the trainer that fits your personality. The time spent in the first year teaching the puppy to live with you makes the next fifteen years more enjoyable. Like all breeds of hunting dogs, the Poodle needs a job to do, like a long walk with you or a good game of fetch. They excel at obedience training, hunting, herding, fly ball, or learning tricks. The Poodle needs human companionship. 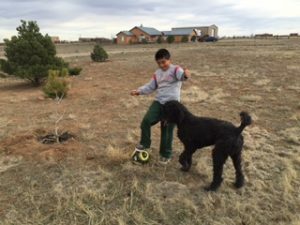 What makes it such a great dog for children of all ages is the high energy that children can have can match the Poodle’s energy level. Consistency in training is a must, and it needs to start from the moment you bring your puppy home. Be prepared, and decide where will your Poodle live before getting your new family member. All sizes of Poodles want to be with their family and can become problems if they’re left alone too much. Even though they love the outdoors, they are not suited to living outside full time. Will your puppy sleep in the bedroom, kitchen, living room, or where? If you decide that this high-maintenance, energetic, hard-headed dog with the famous sense of humor is for you, The Enchanted Poodle Club would love to help you succeed. Please contact us so that we can give you the benefit of our experience with the breed and resources for grooming and training in Albuquerque. We want your new family member to be an asset to your home and to you. The Enchanted Poodle members are here to assist you with your Poodle friend. You may have the Poodle you choose live with you for 15 years or more. The terms Doodles and Designer are marketing terms just as Tea Cup Toy and Royale Standard are marketing terms. Enterprising breeders who see the money that the public will spend to get something “different” with the help of the news media have come up with these terms. These breeders are certain much of the public are impulse buyers and don’t do the necessary research to find out if they are getting rooked. A Doodle is a mixed breed dog not a purebred dog and it will never be a pure breed. It takes more years than the enterprising breeder can spend to develop a breed of dog that breeds true to the wanted characteristics. Poodles have been around for more than 2000 years and were bred for certain useful characteristics. A Doodle can have the characteristics of either parent so until it is grown you have no idea what it will look like or act like. The bottom line is if you want a mixed breed dog, please go to a shelter and adopt the mixed breed dog that fits your personality and lifestyle. All puppies are adorable. Do your homework and decide if you want a pure bred Poodle or if you want a mixed bred dog. If you decide on a mixed bred dog, donate your dollars to a shelter where your money will help care for other mixed bred dogs and save a dog’s life. Designer dogs actually are pure bred dogs. It took years of constant work to breed for the designed characteristics of each breed of dog. While the breeders of mixed bred dogs like to use the media term Designer, they haven’t designed anything. These breeders have merely put two different breeds of pure bred dogs together. They have no idea what the result will be. They know the public will buy impulsively. They know they can make money selling these puppies. They know they don’t have to live up to a higher standard. If you want a Designer dog, research the different pure breeds and decide which characteristics fit your personality and life style and acquire a real dog designed for a specific purpose.